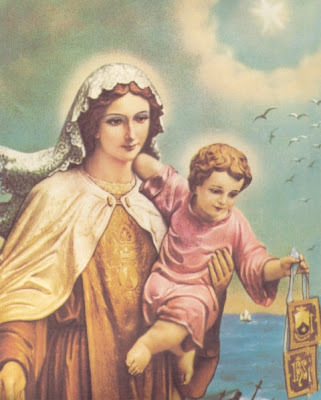 The novena to Our Lady of Mt Carmel begins today July 8, 2008. The Carmelite Scapular was given to the world as a symbol of the protection and help of the Holy Mother of God when no other help is available, particularly at the hour of death. As Our Lady stood at the foot of the Cross, she stands with the Church in the present ordeals; she stands with each of us. Let us pray for the Girard family, for the Christians in Iraq, and for all of our needs. Let us pray for all the children of the world, especially those who are in danger. O most beautiful Flower of Mt Carmel, fruitful vine, splendor of Heaven, Blessed Mother of the Son of God, Immaculate Virgin, assist me in this my necessity. O Star of the Sea, help me and show me herein you are my Mother. O Holy Mary, Mother of God, Queen of Heaven and earth, I humbly beseech you from the bottom of my heart, to succor me in this my necessity, there are none that can withstand your power. Brown Scapular: a "Silent Devotion"
O Almighty and Eternal God, Who sees us surrounded by so many dangers and miseries, grant in Your infinite goodness that the Blessed Virgin Mary, Mother of Your Divine Son, may defend us from the evil spirit and protect us against all adversities, that always and with prompt succor she may deliver us from every evil of soul and body, and safely guide us to the kingdom of heaven, through the merits of Our Lord Jesus Christ, Your Son, Who lives and reigns with You in the unity of the Holy Spirit, one God, world without end. Amen." make abortion in any form illegal, and who will protect the life of each individual at every stage. and to live for Him alone. in our country and for the uprising of a culture of life. and the whole world. Amen. "My prayer will intensify at the feet of Our Lady for the intentions of the whole Church, in particular for the sick, the abandoned, as well as for peace in the world." "May Mary be for all of you," he added, "in particular for young people, the Mother always attentive to the needs of her children, a light of hope that illuminates and guides your ways." Feast Day September 23 rd. "Mary, take over and resolve what I am not able to resolve. Take care of those things that are beyond my reach. You have the power to do so. Who can ever say that he was disappointed in you after having called upon you? "Mother, take over at this moment when I see nothing, when there does not seem to be any light in the tunnel, this moment of doubt, fear, this hour of making the right decision when everything seems to be going against me." Encouraging and Equipping Women for the Glory of God! This is the scariest election we as Christians have ever faced, and from the looks of the polls, the Christians aren't voting Christian values. ability to call upon God to heal it. I challenge you to do so. During WWII, there was an advisor to Churchill who organized a group of people who dropped what they were doing every night at a prescribed hour for one minute, to collectively pray for the safety of England, its people and peace. This had an amazing effect as bombing stopped. There is now a group of people organizing the same thing here in America. The United States of America and our citizens need prayer now more than ever! (8PM Central, 7 PM Mountain, 6 PM Pacific), stop whatever you are doing and spend one minute praying for the safety of the United States, our troops, our citizens, for peace in the world, the upcoming election, that the Bible will remain the basis for the laws governing our land and that Christianity will grow in the U. S.
prayers are the most powerful asset we have. Thank you. Please pass this on to anyone who you think will want to participate.